The posthumous First Folio printing of William Shakespeare’s plays in 1623 represents a landmark development in the history of English drama, rescuing some of the bard’s works that would have been lost forever. 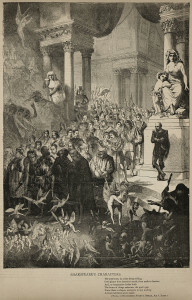 The earlier editions that do exist, however, differ markedly from the First Folio, and there is little evidence that Shakespeare oversaw their publication. What, then, is the “real” text? The Shakespeare we know emerges from hundreds of years of this debate. 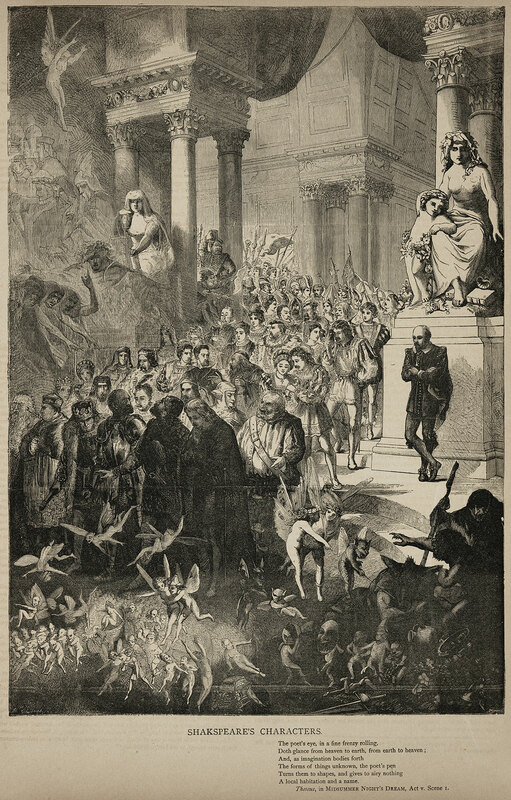 Current holdings and recent acquisitions in Rare Books and Special Collections shed light on the discussion as it developed into the nineteenth century. Selections from the Second and Third Folio accompany printings by some of Shakespeare’s earliest critical editors, including the famous poet Alexander Pope and the moral censor Thomas Bowdler. 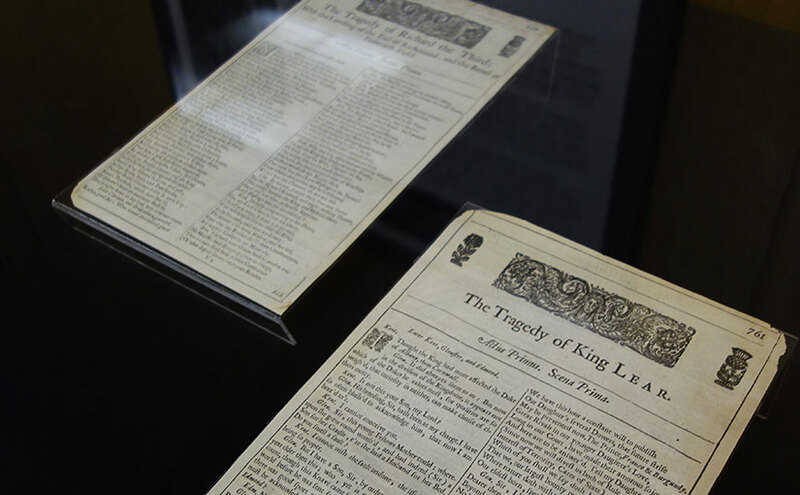 This month’s spotlight exhibit is curated by Daniel Johnson, English Literature and Digital Humanities Librarian, and accompanies the special traveling exhibit “First Folio! The Book that Gave Us Shakespeare, on tour from the Folger Shakespeare Library.” The exhibit is open to the public 9:00am to 7:00pm Monday through Friday and noon to 5:00pm on weekends, through January 29, 2016 (extended hours due to the “First Folio!” exhibit). “First Folio! The Book that Gave Us Shakespeare” on tour from the Folger Shakespeare Library will arrive at Rare Books and Special Collections in the Hesburgh Library during the first days of 2016 as one of the first stops of the exhibit’s yearlong nationwide tour. The exhibit will open on Wednesday, January 6 with a special ribbon-cutting ceremony (read more below). Guided tours of the First Folio exhibit will be offered daily by Hesburgh librarians and curators — Monday, Wednesday and Friday at 3:30pm; Tuesday and Thursday at NOON; and Saturday and Sunday at 2:00pm. Tours will meet by the entrance to Rare Books and Special Collections (102 Hesburgh Library, first floor). Reservations are not necessary. If you are planning to bring a group, please feel free to alert Rare Books and Special Collections directly about your visit: rarebook@nd.edu or 574-631-0290. Times are subject to change. View this self-guided exhibit whenever the library is open. In January, Shakespeare at Notre Dame kicks off “SHAKESPEARE: 1616-2016,” a yearlong series of performances, conferences and special events commemorating the 400th anniversary of William Shakespeare’s death and his legacy. The First Folio exhibit and Notre Dame’s year-long celebration officially launch at 16:16 (4:16 p.m.) Jan. 6 with the ribbon-cutting ceremony in the Hesburgh Library’s new North Entrance Gallery. Formal remarks will precede the official ribbon cutting beginning with Scott Jackson (Executive Director of Shakespeare at Notre Dame), followed by Diane Walker (Edward H. Arnold University Librarian), Rev. John I. Jenkins, C.S.C. (President of the University of Notre Dame), Pete Buttigieg (Mayor of South Bend), and John T. McGreevy (I.A. O’Shaughnessy Dean of the College of Arts and Letters). All four 90-minute lectures are free, open to the public, and located within the Hesburgh Library. During the third week of the First Folio exhibit – Monday, January 18 through Friday, January 22 – there will be increased traffic from 9am–3pm. Shakespeare at Notre Dame will be leading 90-minute encounters with over 1000 students from throughout Indiana and Southern Michigan. Please be aware that access to the First Folio exhibit and to Rare Books and Special Collections resources will be limited during this time. With his excitement barely contained, Dan Johnson reveled in what a great addition this would be for RBSC—a map of Middle Earth annotated by J. R. R. Tolkien himself! Dan went on to explain that this map was recently discovered stuck in the renowned illustrator, Pauline Baynes’ personal copy of The Lord of the Rings and that it promises to be an important piece of Tolkien ephemera. “If only we had a Tolkien collection to justify pursuing this,” he lamented. Dan’s enthusiasm and appreciation for the Inklings is among his many literary interests. He studied English literature, earning his BA from Bethany Lutheran College in Mankato, MN, and then went on to earn an MA from Wake Forest University. 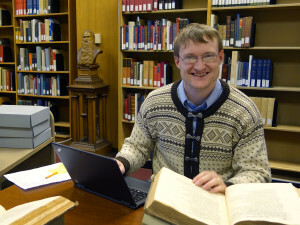 He is currently researching the supernatural in the 18th century. Part of this research examines the work of Charles Brockden Brown, the first major American novelist and Gothic fiction pioneer. He is finishing his dissertation, “Visible Plots, Invisible Realms,” en route to earning his PhD in English literature at Princeton University. All the while he is learning the ropes of the library world as the new English Literature and Digital Humanities librarian for Hesburgh Libraries. Having come to Notre Dame in August, Dan quickly immersed himself in getting to know the collections, faculty, and students. Within the first couple of weeks, he was meeting with English students and faculty, and preparing classes that featured rare materials, including the works of Samuel Taylor Coleridge. He pulled out multiple editions of The Ancient Mariner and along with Professor Yasmin Solomonescu guided the students through Coleridge’s marginal glosses, talking about the book as artifact. Dan is quite excited about enhancing RBSC’s literary collections. He has acquired two significant additions: a 1725 edition of Shakespeare’s works edited by Alexander Pope and the 1818 second edition of The Family Shakespeare in Ten Volumes edited by Thomas Bowdler. Both of these will be featured in his upcoming Shakespeare spotlight exhibit in RBSC—this will be the first exhibit Dan has ever curated. It will coincide with RBSC’s hosting of First Folio! The Book that Gave Us Shakespeare, the Folger Shakespeare Library’s touring exhibit that will bring a First Folio of the bard’s plays to each of the 50 states, Washington, D.C., and Puerto Rico. Dan will also lead guided tours of both exhibits and invites everyone to brave the snow and come out to learn about Shakespeare. Rare Books and Special Collections will be closed for Christmas and New Year’s Break (December 24, 2015, through January 5, 2016). We remain open for our regular hours during Reading Days and Exams, and welcome those looking for a quiet place to study. In January, RBSC will be host to the exhibit First Folio! The Book that Gave Us Shakespeare, on tour from the Folger Shakespeare Library. Notre Dame marks the official first stop of the First Folio national tour and exhibit. Shakespeare at Notre Dame, along with faculty from the College of Arts and Letters, and members of the distinguished Shakespeare residency company Actors from the London Stage will also host the “Folio Fridays” Lecture Series, performances, workshops, and special displays throughout the month of January to complement this momentous occasion. The exhibit will open on Wednesday, January 6 with a special ribbon-cutting ceremony.